Life as a business traveler is never dull. One minute the entrepreneur is in New York City, the next, he or she is halfway around the world taking out a client in Tokyo. Even if living out of a suitcase starts to become second nature, a business traveler can sometimes use a little help with such things as putting on a favorite scent for an important meeting (though the fragrance bottle was left at home) or scoring a late-night bubble bath and a glass of prosecco to relax after a long stressful workday. This isn't the typical round of golf. First, the hotel guest and perhaps some clients play a round of 18 holes at one of three championship courses by the Four Season's Whistler resort in Canada's British Columbia. Next, from the green at the 18th hole, they will meet a personal PGA pro and board a private helicopter. Once they hit 8,000 feet above sea level, they'll reach their final destination, the coveted 19th hole atop a mountain. Guests do land on -- and tee off from -- a glacier. Appetizers and cocktails will await them along with biodegradable golf balls, which they'll use to work on their swing and technique. Every Thursday and Saturday night at 9:00 p.m., hotel guests are led through slow stretches and breathing exercises inside the 47th-floor aerobics studio of the Park Hyatt in Tokyo. With breathtaking views of the city as their backdrop, guests are pampered with aroma oils to increase circulation and rid the body of stress. Talk about a great way to slow down the brain and relax the body after a grueling workday! 3. 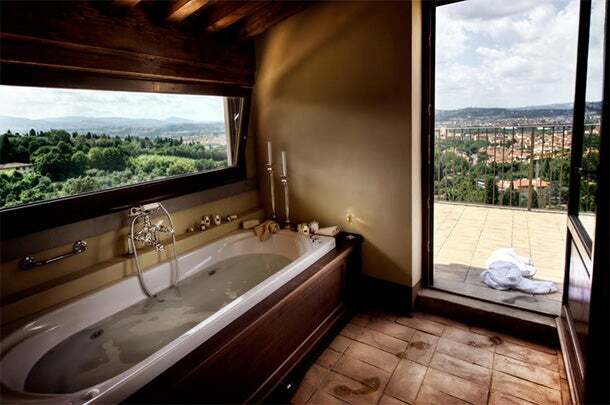 The ultimate bubble bath. It's pretty darn easy to get carried away on a night out on the town in the New Orleans' French Quarter. When the next day rolls around and there's business to attend to, don't let the fun from the night interfere. That’s where the Ritz-Carlton’s recovery concierge steps in. Whether the guest wants a spa service or just a “Hair of the Dog” Bloody Mary, the hotel has things covered. It also promises not to tell the boss (unless she's the very guest requesting the service). 5. A personal fragrance butler. Packing and traveling with perfume and cologne always poses a risk. What if the unthinkable happens and liquid leaks inside a suitcase? At The Carlyle in New York City, a personal fragrance butler has just the right scent for that make-or-break business meeting. 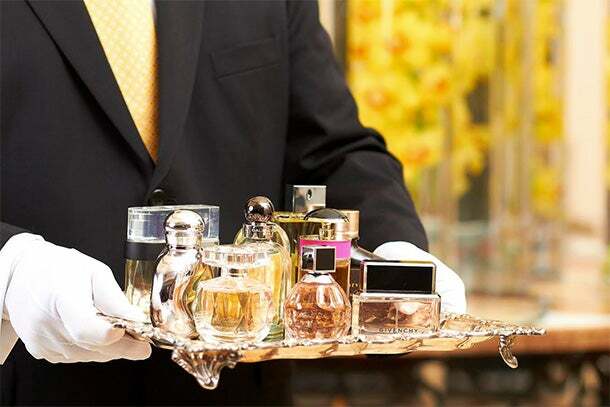 The Carlyle’s fragrance butler will help procure just the right perfume or cologne (from Chanel to Stella McCartney or Tom Ford scents) to take on any business occasion. 6. The ultimate tequila tour. The visitor's experience begins on board a private helicopter chartered by the Four Seasons in Mexico's Punta Mita to the UNESCO-designated town of Tequila, where for centuries drinks have been crafted from agave. After arriving at the Jose Cuervo distillery in Tequila, guests receive a tour and a gourmet lunch, composed by a Four Seasons chef, that can be enjoyed amid live music and sampling of tequila. Could this be just the backdrop for closing an important business deal? Some of the above amenities are included in the charge for the hotel stay. Others are not. Be sure to check with the concierge before booking.